Good4Nuthin is Pete and N8 the Gr8 from The CUF. 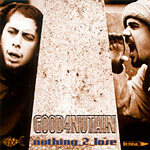 Nothing 2 Lose is one of the best albums ever to come out of the CUF crew. Unfortunately it has never been widely available. Produced by N8 the GR8.